My friends, you know all about quick and simple meals and I have loved working with the National Frozen & Refrigerated Foods Association and bringing you some fun meals that come from our freezer and refrigerator! 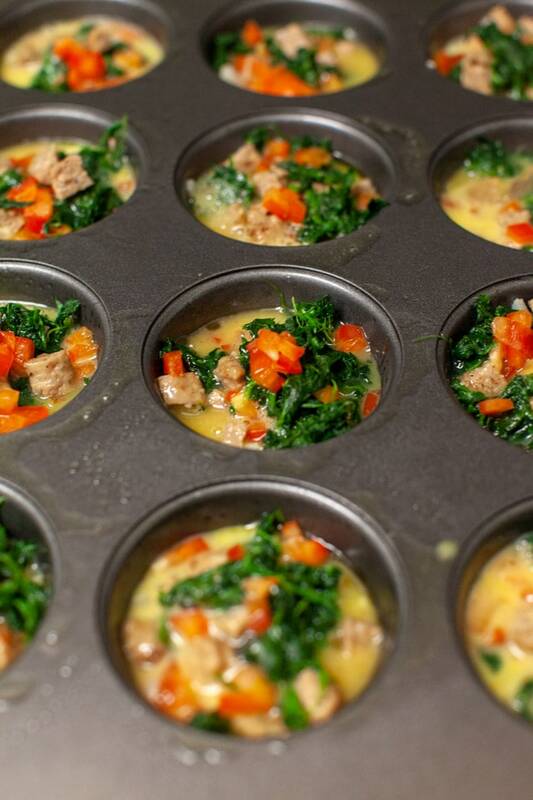 I made you these little breakfast egg cups, you bake them in a nonstick cupcake pan and you can totally make them ahead. With just five ingredients, I’m not counting the salt and pepper! 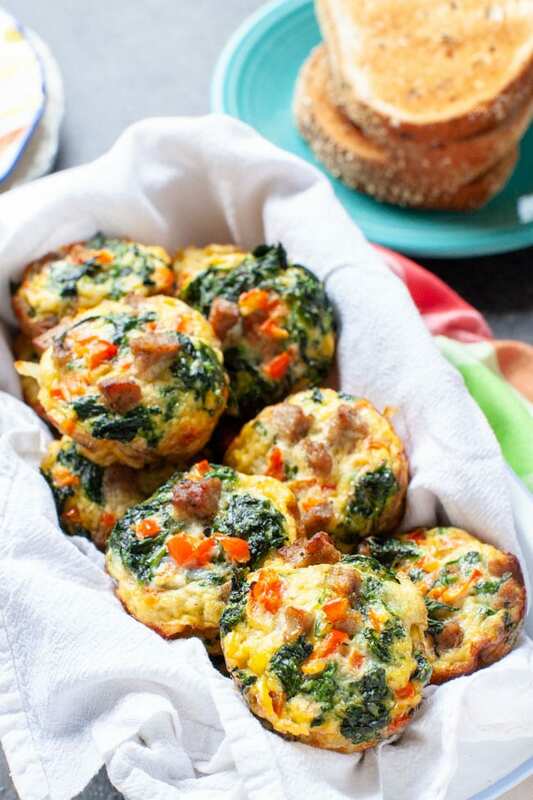 🙂 What I love about them is you can serve them at your next holiday brunch or make them on Sunday and have them for breakfast the entire week. They are so versatile! Here’s what I’m using. 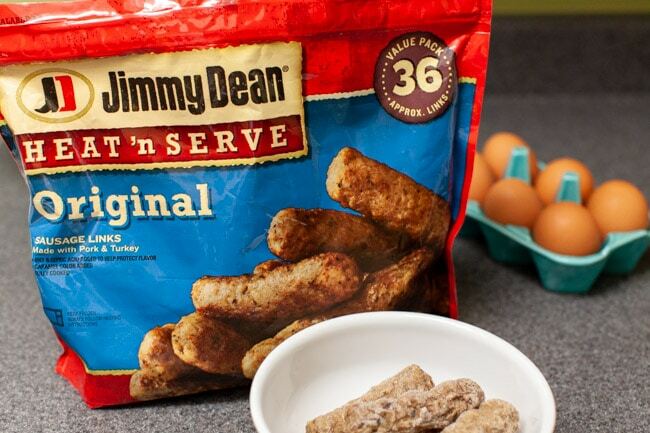 When I asked Curtis to pick up the Jimmy Dean Heat ‘n Serve Original Sausage Links in the freezer aisle, he was so excited about these. 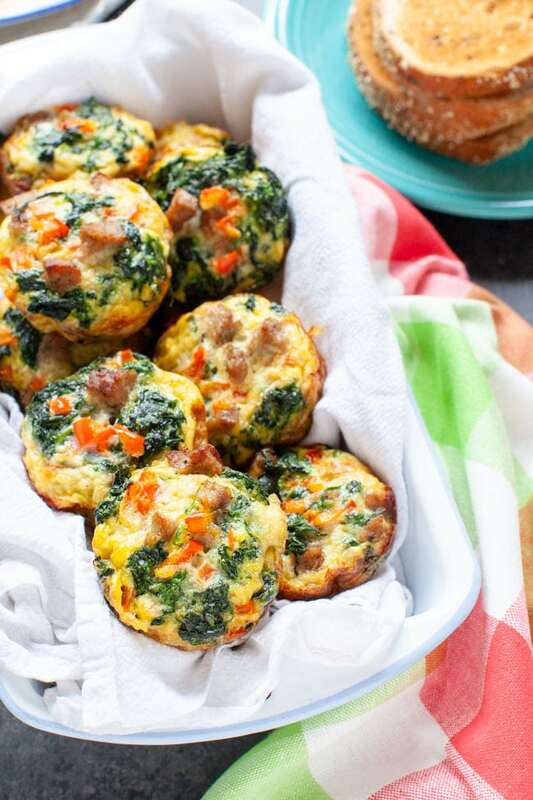 We can easily make breakfast with these on the weekends or during the week. 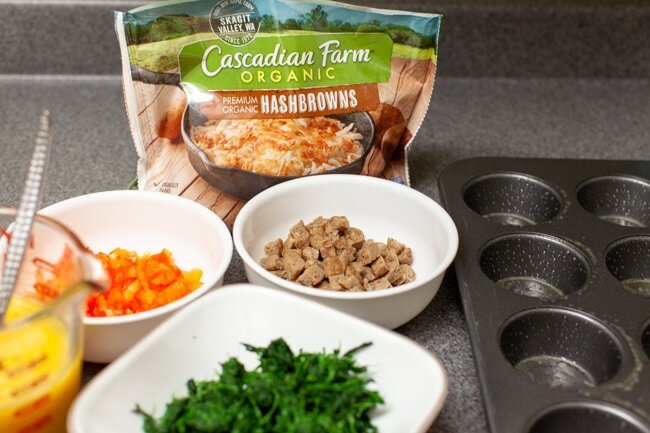 Cascadian Farms Organic HashBrowns and Spinach, I’m so excited to find these at my local grocery store. I love the hashbrowns, they are so good! 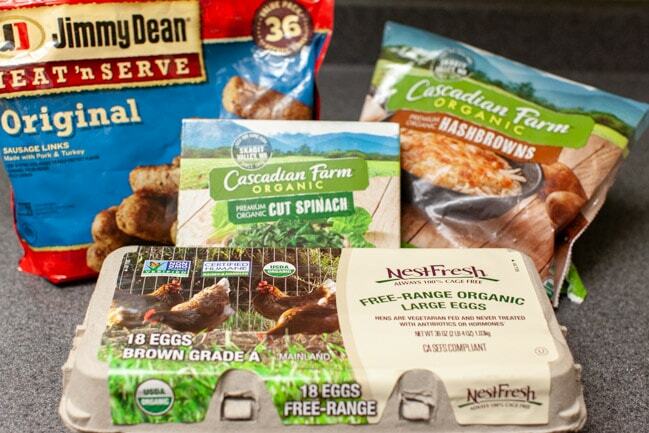 And NestFresh Free-Range Organic Large Eggs, we have a new favorite brand. We love that they are cage free too! 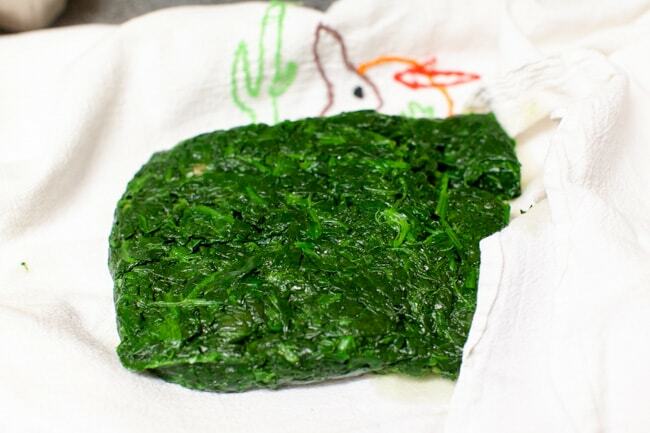 First thing you’re going to do besides turn the oven on is defrost the spinach. Take it out of the paper box and put the plastic bag in a bowl of cold water. Next, I defrost the Jimmy Dean sausage links in the microwave using my defrost setting. 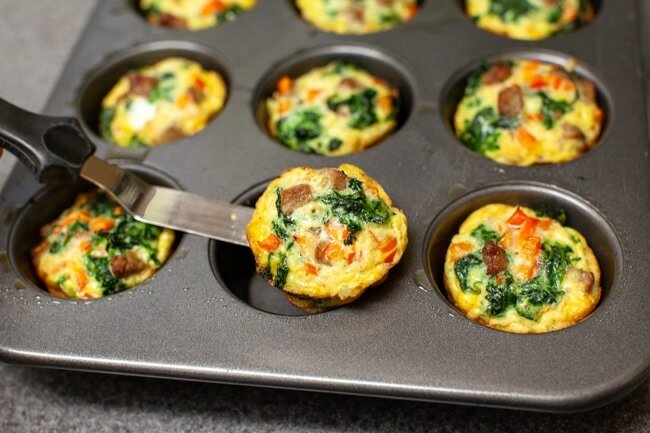 You want to cut these into little pieces so when you bite into the breakfast egg cups, you’ll get sausage in almost every bite! And then, I cut them into little pieces. Instead of cutting them into little pieces and then cutting those slices into littler pieces. 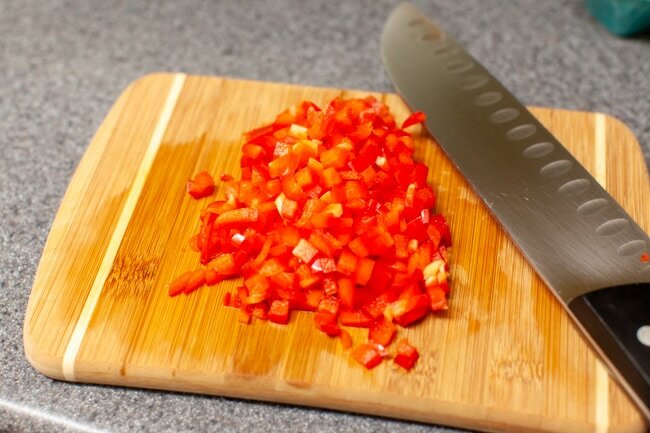 Chop up the red pepper. And then, we’re back to the spinach. 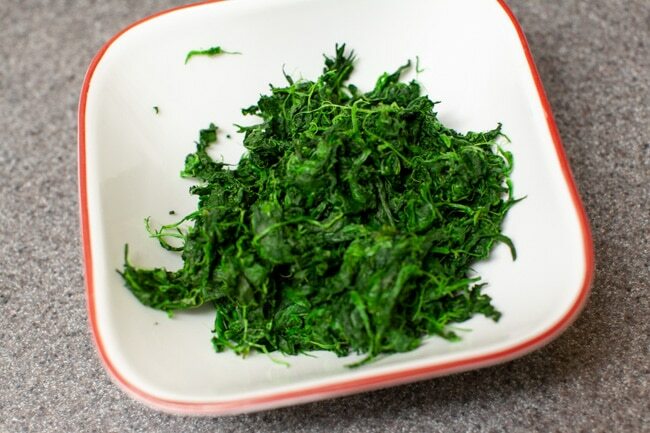 You’re going to squeeze all of the water out of the spinach. I use a potato sack dish cloth or you can use paper towels. Squeeze and wring out the water. And that’s the spinach you have left. 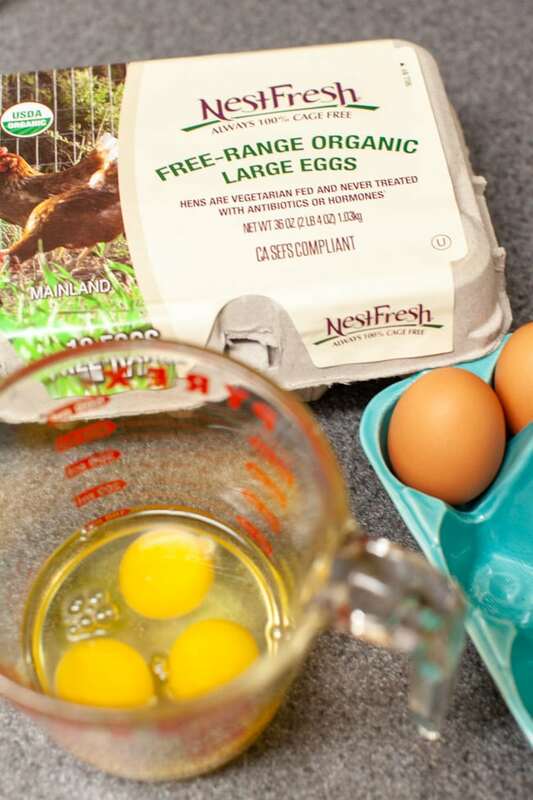 Beat the NestFresh Free-Range Organic Eggs in a measuring cup. That way it’s easy to pour the eggs into the muffin pan! Generously spray your cupcake pan. And make sure you’re using an actual nonstick cupcake pan. Don’t make the same mistake as I did! I have everything lined up and ready to go! 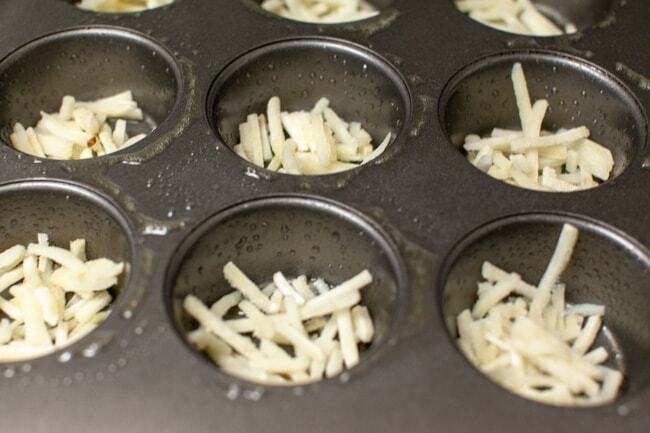 Add the hash browns to the bottom of each muffin cup. Then, layer with sausage links and spinach. And red pepper. And repeat. I did notice I had some spinach left over and you probably will too. You can use it make this spinach artichoke dip! 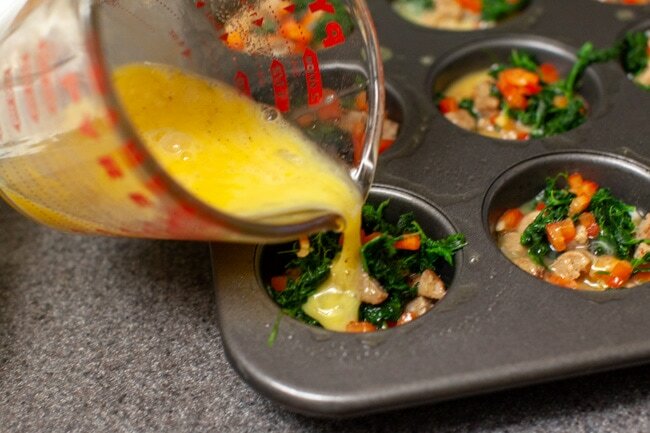 Pour the beaten eggs into the muffin pan. You’re only filling them about halfway or a little bit more than half way. Be sure not to over fill them! 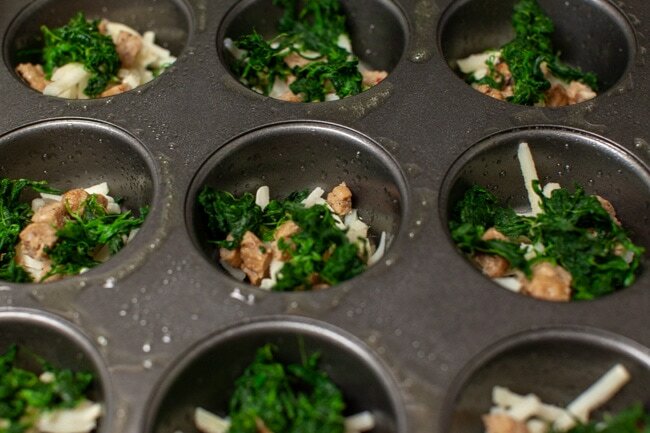 Bake them and then use spatula to make sure the sides are not stuck to the muffin pan. They are so so good and I know you’ll love them for your next holiday party. I totally didn’t even intend to make them festive looking but the green and red are so festive in the egg cups, aren’t they? 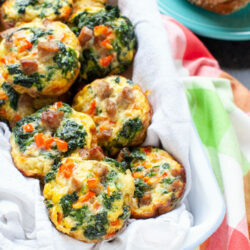 They are great for that party or even that quick breakfast to go on those busy weekday mornings! Don’t forget to check out the video that I made for this recipe too! 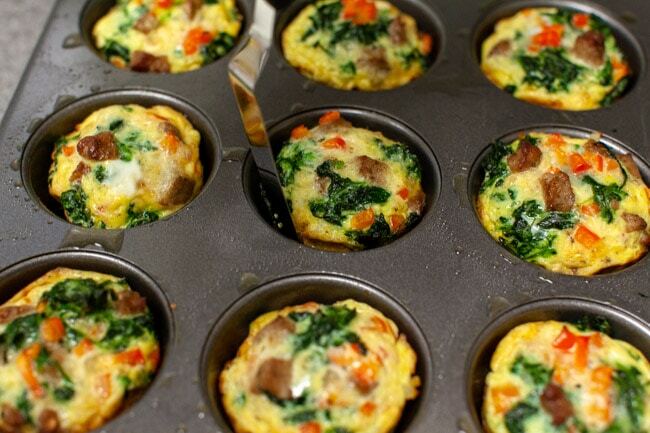 I would love to know if you have made little egg cups or omelettes with your muffin pan before? Prep the ingredients. 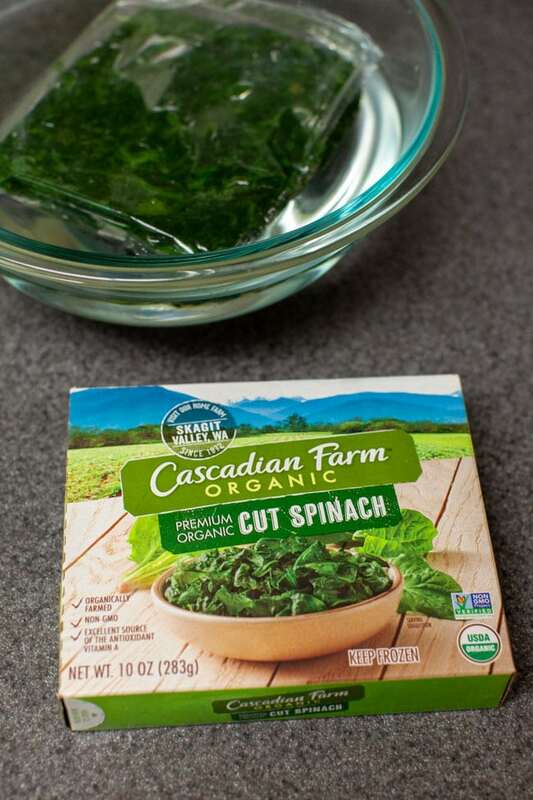 Open the Cascadian Farm Organic Cut Spinach package and remove the plastic bag with the spinach place into a bowl and add cold water until it’s covered This will take about at least 15 minutes (you can make it go a little faster by changing the water a couple of times). 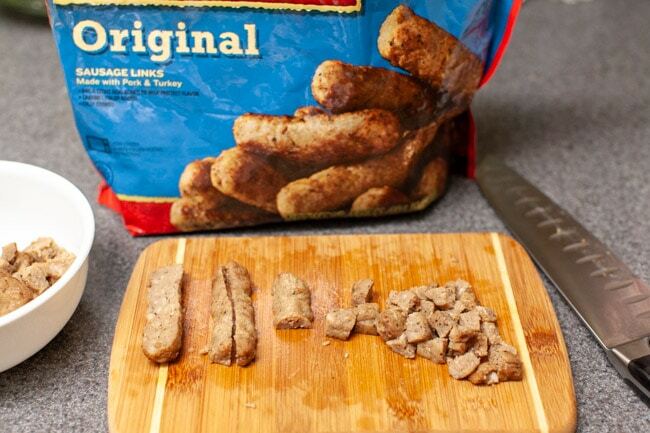 While the spinach is defrosting, remove the Dean Heat ’n’ Serve Original Sausage Links from the bag and defrost in the microwave for a few minutes, just so you can cut them up. 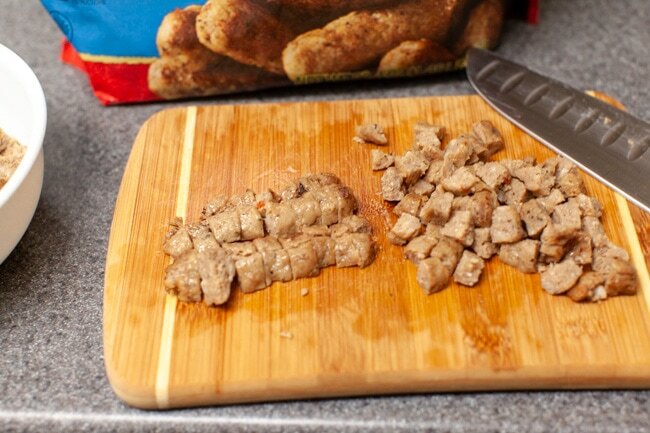 Cut up the sausage links into small pieces (into 5 pieces and then each piece in half or quarters). 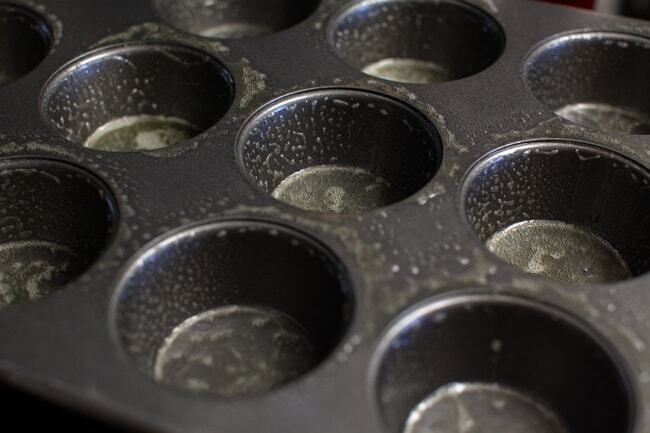 Prep your nonstick muffin tin/cupcake pan and spray each muffin cup with nonstick cooking spray. Back to the spinach. 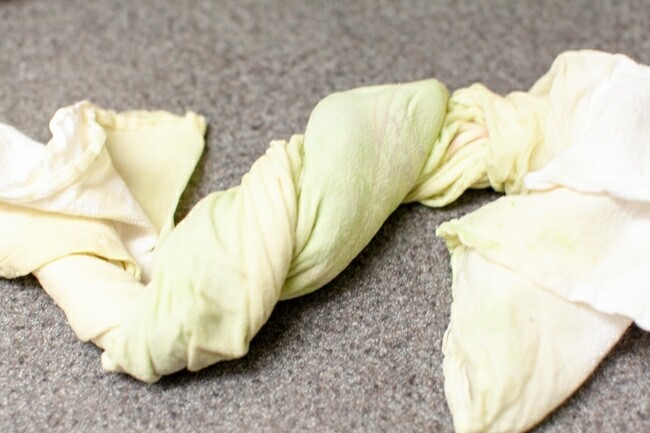 Remove from packaging and squeeze inside a of kitchen towel to remove the moisture. Take the beaten NestFresh Free-Range Organic Eggs and add salt and pepper to them. 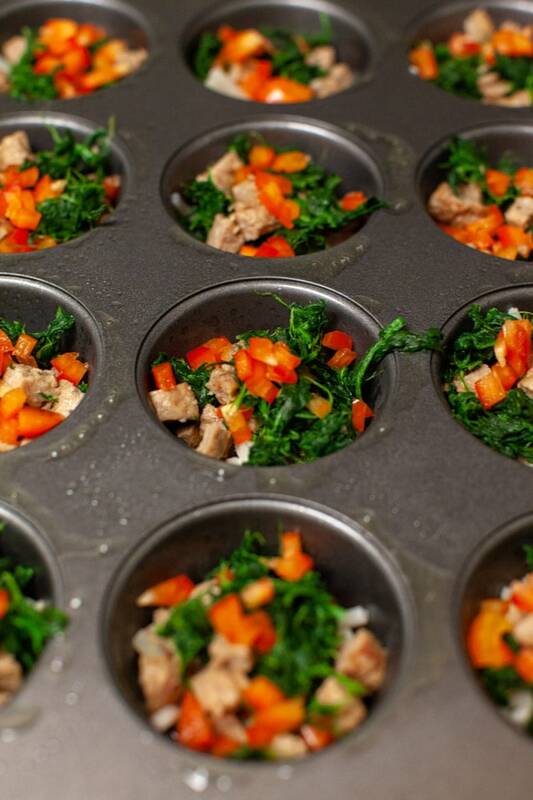 Then, pour into each muffin cup, you’re only filling them about half way (be careful to not over fill). Bake for 15 to 17 minutes at 425 degrees F or until the eggs are cooked to your liking. 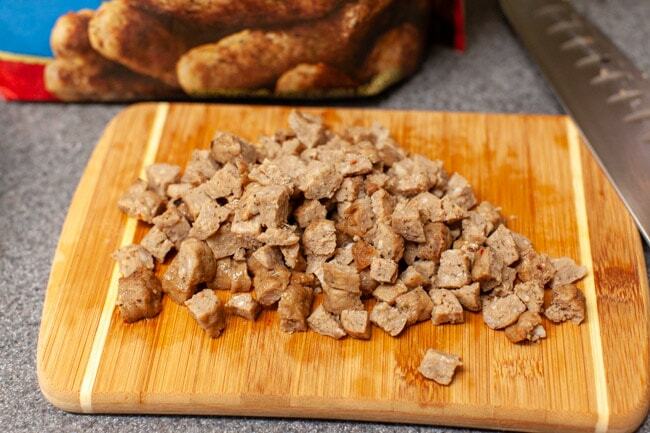 Store them in a tightly sealed container in the refrigerator. It’s easy to reheat them. Put them on a microwave-safe plate and cover, microwave for about 30 seconds and add 15 seconds at a time until heated through. Guess what? 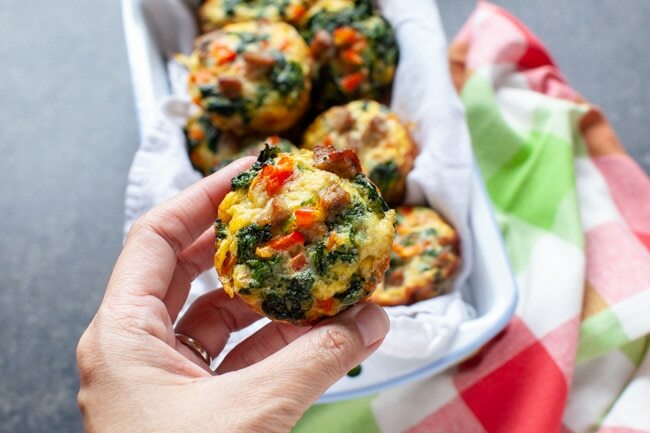 You can totally make these ahead and freeze them! Place them on a lined baking sheet separated (not touching) and place them in the freezer for at least 30 minutes. Then, place them into a zippered plastic bag. That way when you store, them they won’t stick together and freeze together. To reheat, heat oven to 400 degrees F (while the oven is reheating, remove them from the freezer and place on the counter). Bake for 16 to 17 minutes, or until heated all the way through.